The desert for suits in search of corporate meetings and conferences and a bit of family fun on the side in our city guide. THERE was a time when flying into Abu Dhabi meant craning one’s neck to catch a glimpse of a few twinkling lights in the darkness of the desert below before walking across a rough tarmac to a tiny airport shelter. Things have changed. These days you land to enter a gigantic futuristic rippling wave that is the refurbished Abu Dhabi International Airport (www.abudhabiairport.ae), a tad over the top with its multi-hued architectural fancy and walkways. Don’t be surprised if you feel like you’re in a Las Vegas casino. But this is Abu Dhabi. If it were not over the top, it would still just be a little desert speck in the sands, inhabited by nomadic tribes sitting on their black gold. But it’s because Abu Dhabi is the world’s largest producer of oil that there’s been enough fuel, in every sense, to catapult the place into the big league over the past 50 years. Things really began to change after long-time ruler Sheikh Zayed passed away and his son Sheikh Khalifa took over in 2004, relaxing restrictions on alcohol and land-sales to foreigners among other things, in a bid to attract more investment and tourism. These days, the rather glam Abu Dhabi is the capital of the sprawling United Arab Emirates, and with a population quickly closing in on a million. It is second only to Dubai in terms of population. But more interesting is the fact that Abu Dhabi is an archipelago made up of almost 200 islands, all spread out along the coast of the azure Arabian Sea. Visitors can go dolphin and turtle watching; and island hopping is a popular weekend activity for residents. But this isn’t what Abu Dhabi is most famous for. Most car aficionados (and kids) will have heard those heart-racing words, “Ferrari World” (the world’s largest indoor theme park). At this large and eye-popping confection on Yas Island, also home to the annual Formula 1 Etihad Airways Abu Dhabi Grand Prix, visitors can get a good glimpse of the racing circuit. But more on that later. Get a feel for things at the official Abu Dhabi visitor website (visitabudhabi.ae). If you don’t feel the urge to fly directly into Abu Dhabi, it’s a simple 130km or two hour bus ride straight through the desert, down the stretch of Sheikh Zayed Road, which connects Dubai to Abu Dhabi. The bus ride will cost a trifling 25 dirhams on the outward journey from Dubai, and another 15 dirhams to return. There’s also a direct bus connection from Dubai airport to Abu Dhabi and, if you’re lazy or in a hurry, flagging down a taxi is always an option. Although Abu Dhabi has recently built itself up as a tax-free salary haven for foreigners – attracting fairly large numbers of skilled expatriate workers – it’s now focusing on the business and cultural traveller. This is where the Guggenheim Abu Dhabi (2017), Louvre Abu Dhabi (2015), and Zayed National Museum (2016) make their splash. And it is just as kid-friendly as neighbouring Dubai. But the archipelago is a lot more spread out over a greater area than one would imagine. So be sure to figure out where you need to be if you’re going on business. Though roads are probably the best in the world, and time flies when you’re staring at the sheer number of flash cars, traffic is a small problem here as it is in any fast-developing city. We start our Abu Dhabi business hotels review with the proud standard bearer of all Emirati hotels, nestled in the very corner of the main city centre. The fact that this property is decorated with almost 1,000 Swarovski crystal chandeliers, and has 114 domes, each 80m high, should in itself be warning enough. 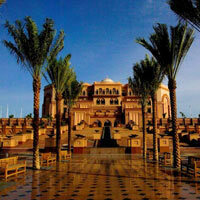 Welcome to the lavish and eminently decadent Emirates Palace. Owned by the Abu Dhabi government and operated by the Kempinski hotels group, no stone has been left unturned when it comes to whiz-bang glam. The lobby of the property is elaborately decorated in gold leaf and marble. There are 394 rooms and suites on offer, each with in-room high speed internet and a 51-inch flat-screen plasma television. But it’s the pristine 1.3km private beach, two swimming pools, tennis courts, gym, Kid’s Zone, and the Anantara Spa that elevate this property several notches – “seven stars” it says. In December 2010, the property showed off the world’s most expensive Christmas tree, valued at over US$11 million. But the true value of the Emirates Palace lies in its MICE facilities. There’s over 7,000sq m of meeting and conference space, and the auditorium can hold over 1,000 people, with the Grand Ballroom seating 2,400 guests. Over 3,000sq m of outdoor space is available for weddings and other events making this a fine pick for Abu Dhabi conference hotels or for a swank CEO chinwag. The hotel’s nine restaurant line-up includes Alan Yau’s former flagship restaurant imported from London – Hakkassan – ranked high in the city’s eat-out stakes, and popular with hotel guests and locals alike. The brilliant blue bar is open till 2am. But, if the fact that five kilograms of pure edible gold is used each year to decorate desserts at the Emirates Palace or that the Gold-to-Go machine on the premises issues gold at market rates stamped with an image of the place doesn’t floor you, then head on to the architecturally spectacular Jumeirah at Etihad Towers Hotel. This is a complex of five towers – three residential, one office, and one hotel. This skyline set reappears in most photos of the city. 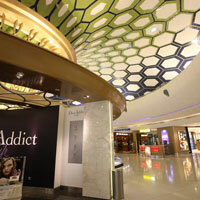 The hotel has 382 rooms and suites, and 199 serviced residences for those shopping for Abu Dhabi long-stay hotels. Designed for the business traveller, amenities include a dedicated Club Executive Lounge with all-day food and drinks, an internet lounge, shower suites, and a four-meeting-room business centre as well as conference facilities and ballroom. There’s also the Talise Spa and a gym for an après work unwind. Tourists wanting to simply gawp at the Jumeirah at Etihad Towers can pay 75 dirhams to head up to the 75th floor viewing platform for a breathtaking sight across the Arabian Gulf. The cost to go up is worth it – and it can be redeemed for a tea or coffee at the lookout point café. Close by, also in the Al Khubeirah district, are the Hilton Abu Dhabi Hotel – with its Arabian Gulf views, a short walk from the Heritage Village area and popular local shopping outlet, Marina Mall; and the mid-rise old-style InterContinental, which occupies a stretch of private beach. Expect fresh swimming pools, beach cabanas and a landscaped area – but not long to go, it’s all due to open closer to the end of 2013. Deeper within the business district is the five-star Le Royal Meridien Abu Dhabi with its 10 restaurants and bars to ensure you never have to leave the place. Check out the rooftop revolving restaurant, Al Fanar. But even better is the fact that all 198 rooms and 79 suites offer views of the Corniche and the Arabian Sea. If, however, you’re looking for an Abu Dhabi serviced apartment, the Hala Arjaan by Rotana offers cosy furnished deluxe digs in the heart of the city. Facilities include a large recreation centre and swimming pool. 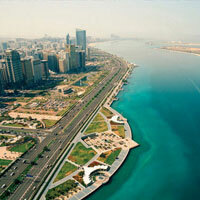 A hop skip and a jump across is Al Maryah island, the new business district. With fresh developments sprouting at regular intervals it also includes the chic, 34-storey steel-and-glass Rosewood Hotel (opened May 2013), a business traveller magnet. The hotel serves up 189 rooms with an iPad lifestyle manager, sliding door peekaboo bathrooms with large soaking tubs, a generous slathering of marble, and twin vanities. Also expect an après-work rubdown at the signature Senses Spa followed by a nibble at a choice of nine restaurants. Think pastel tones and views in Cinemascope. For corporate meetings and more there’s 17,808sq ft of conference and banquet space. This is a luxury hotel with contemporary trim. Headed back to the mainland, the Abu Dhabi National Exhibition Centre (ADNEC) is attached to Capital Gate, a tower that famously tilts 18 degrees backwards. Make of that what you will, but here also sits the Hyatt Capital Gate, which allows for short-walking access to conference venues at the ADNEC and International Convention Centre (ICC). Here, rooms and suites occupy the 18th to 33rd floor of the Capital Gate tower, offering panoramic views through the floor to ceiling windows. Internet access is widely available through the complex, as are the benefits of the Hyatt Gold Passport global loyalty programme. But if you’re not in town purely for business, The Ritz Carlton Grand Canal located on the shore of the Grand Canal, cutting through the main strip of Abu Dhabi, provides not only superb views of the stunning Sheikh Zayed Grand Mosque (this is the only spot in the entire city with unimpeded views and a chance to hear the namaaz at sunset), but also a stylish family getaway. The candy jars strategically located throughout the property, although apparently popular with adults, won’t hurt either. Step into the grandiose lobby where a magnificently garbed Arab pours tea and offers updates to passersby. He’s popular with the ladies for photo-ops. One of the largest properties in town, the 447 suites and 85 private villas offer vast views on every side, as well as access to an enormous outdoor pool, and 10 high-class restaurants. Lobby spaces offer complimentary WiFi – you have to pay for it in your room. But it’s the kids who are the real guests at this Abu Dhabi child friendly hotel – on arrival they receive a complimentary passport to a host of activities and games. A short boat-ride across the Grand Canal in the Qaryat Al Beri area are neighbours the Fairmont Bab Al Bahr, and the Shangri-La Qaryat Al Beri. The Fairmont, a rather stoic seeming brick and glass building with MICE facilities, offers luxurious rooms with an “organic” theme, and several rooms have the added bonus of bathrooms with creek-side views. The Fairmont’s President’s Club access is available for Premier and Platinum Fairmont members. Reebok workout apparel and footwear, an MP3 player, and yoga mat can be delivered to your room upon request. The Shangri-La Qaryat Al Beri offers a slightly more Arabic touch, with lush gardens and a winding waterway with traditional abra boats, to ferry guests around the property. 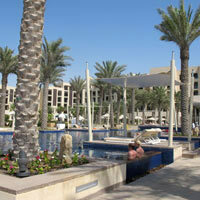 There’s also a traditional Arab souk for shopping fanatics, and a private beach. After hours, indulge Chi the Spa with its arsenal of holistic healing. For a stay that’s not quite as lavish or wallet-busting (remember, everything in Abu Dhabi is a minimum five stars) – try the four-star Novotel Abu Dhabi Gate Hotel or the three-star Centro Capital Centre. The former’s high-rise towers have a shisha lounge as the main attraction, whilst the latter, Centro Capital Centre, a member of the Rotana hotel group, is a sleek and easy contemporary address with no frills, but just enough to keep any business traveller in motion. Rooms are on the smaller side, ranking with the size you’ll usually find in London or Hong Kong, but all offer free WiFi and flat-screen televisions, as well as rain showers. Twenty minutes from the airport and 10 minutes from the ADNEC, the location is convenient. Closer to the airport is The Westin Golf Resort and Spa, a lush, contemporary property with, you guessed it, a golf course. Internet access in rooms is available for a fee and ergonomic chairs are on hand for those who want a healthy perch – and a view – while they work. Also find a 27-hole championship golf course, ranked among the world’s top 100, along with a signature Moroccan restaurant. With the goal of creating more cultural experiences for visitors, the attractive Saadiyat Island has been turned into something an exhibition spot. Not only are the new local versions of the Louvre and the Guggenheim coming up here, close by is the Zayed National Museum. The island is a reserve and wildlife is under protection. Spot turtles on the beach and the svelte gazelles that are native to the area. Unlike other parts of the Arabian Sea, you’ll also find the water to be as turquoise as your imagination can stretch. The big daddy of resorts around here is the Monte Carlo Beach Club, which is everything its name says it will be – with a Mediterranean vibe. The breezy cabanas and azure waters will help transport you. But you’re in Abu Dhabi, where luxury is second to none and this top drawer address will ensure you don’t need to leave the property. There’s a Kid’s Club if you’re looking to tuck the children away and relax in the serenity of the spa. But bear in mind, membership is a prerequisite for several facilities. If being a paid-up, card-carrying member of an exclusive club isn’t on your hot list for this year, head to the eye-catching Park Hyatt Abu Dhabi that serves up effortless luxury by the acre. Adjacent to the Saadiyat Beach Golf Club (with an 18-hole course, designed by Gary Player), the property is a sanctuary for beach-lovers and urbanites alike. Starting at 50sq m, rooms are generous; each offering a private balcony, free WiFi, and views of the sands. If you want to step it up a notch, all villas, beach view suites, and garden view suites also come with their own private plunge pools. The white sand shoreline with its pool cabanas is worth a stroll or more and the Atarmia Spa is on hand for wellness therapies and massage. Although Middle Eastern food is a specialty at the Park Hyatt Abu Dhabi, guests will also find Asian food at one of the in-house restaurants; and the Library – a contemporary Parisian tea lounge serves up a selection of French style pastries, teas, and coffee. The St Regis Saadiyat Island is another beachfront address with easy access to white sand underfoot and great ocean views. But this one’s a notch up from the Park Hyatt – while rooms also come with their own private balcony or terrace, they also come with butler. WiFi is complimentary in the rooms, which are dressed to give you the feeling of a cosy apartment. The Residences at the St Regis are available for longer-term ownership and stays. These days the Khalifa Bin Zayed Highway connects Saadiyat Island directly to Yas Island, and you can watch some of the smaller, pretty white sand islands flash by on the way. More popular with the family crowd because – well, yes, you guessed it – this is the home of Ferrari World and Yas Waterworld, enough to keep the kids busy for a week. With a slightly more established selection of hotels, there are a couple of value options here, including Crowne Plaza Yas Island, which is located right next to the Yas Links golf course – and is walking distance to the Yas Marina Circuit, Ferrari World, Yas Waterworld, and the Yas Island Beach. It’s also only ten minutes from the airport, and offers packages for those wishing to catch an event at the neighbouring Du Arena. Rooms are simple and business-like, but serve up all the usual amenities – including free WiFi, a tea and coffee maker, and much more. 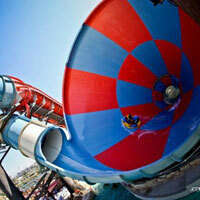 The Radisson Blue Yas Island is a smart option, just ten minutes from the airport. Offering free shuttle bus service into the city centre, the hotel is also an established conferences and meetings hotel. Well setup for the business traveller, those wanting to upgrade to a suite can avail of the walk-in-shower, bathtub, and sun loungers on private balconies overlooking the Arabian Sea. Also on the Radisson menu is the Park Inn by Radisson on Yas Island, which also comes with a swimming pool and spa facility. 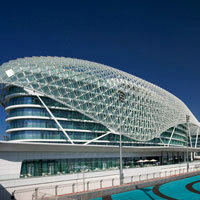 And last, but not least, is the futuristic Star Wars architectural marvel – the Yas Viceroy. With its space age design this is a must-stay-at or at least a must-look-at for those who like sci-fi or thrive on the eardrum pounding from an F1 car at full throttle. All rooms here have a ringside view of the track. With 499 rooms and suites, the glass building is topped by an eye-popping LED canopy that changes colour. Rooms are clean and simple – there’s a nice hi-fi lifestyle room manager to open the curtains, and set your alarm for you. And in the open-plan bathroom, there’s a nice rain shower to make sure all the grime you collect from the fumes on the track next door are washed off. WiFi is free and the pool is on the roof, giving guests a feeling of being on top of the world. Adding to the Desert Islands Resort & Spa by Anantara is the 30-villa Anantara Sir Bani Yas Island Al Yamm Villa Resort (opened July 2013) with ocean frontage, a saltwater lagoon, spa and facilities for meetings and weddings. Expect a beachfront swimming pool, an Anantara Spa Villa, and rustic-chic earth and timber lodgings whose rough-hewn exteriors belie an over-indulgent interior with all mod cons. And that just about brings us to the end of our Abu Dhabi business hotels review – for now. Most eating in the city seems to be done at the hotels. If you’re looking for street food or a quick, cheap and cheerful meal, this is not the place to be. Conversely, if you’re a fan of dolling up and heading out for a night of fun and food – and we’re talking any and every cuisine here – Abu Dhabi could just be the right city to be in. With the advent of luxury hotels in the city, there are quite a few brand name restaurants that have popped up – we’ve already mentioned Michelin starred Hakkassan at the Emirates Palace Hotel. Another long-time favourite is the Marco Pierre White Steakhouse at the Fairmont Bab Al Bahr. Venetian favourite Cipriani has opened an outpost in the Yas Yacht Club Building on Yas Island, and Parisian oldie Entrecote Café de Paris with its staple menu of steak and chips has recently arrived in the Souk Qayat Al Beri. But if price is a consideration, local expats recommend the slightly cheaper but far more friendly Le Beaujolais in the Mercure Centre Hotel on Hamdan Street, for authentic French fare at wallet-friendly prices. If for Abu Dhabi nightlife you are more interested in the bar scene, Ray’s Bar in the Jumeirah at Etihad Towers Hotel is a popular watering hole. For a party, European style, 45 minutes drive out of the city, you’ll find the Blue Marlin Ibiza UAE with its own beach club. Remember, though slightly less liberal with liquor than Dubai, Abu Dhabi is still an Islamic country and alcohol consumption is only legal for non-Muslims and within licensed or private venues (mostly hotels). While neighbour Dubai has already sprinted off with the “shopper paradise” title, Abu Dhabi still offers a few top shopping options for dedicated spendthrifts. For designer goods, the Avenue at Etihad Towers (www.avenueatetihadtowers.ae) offers all the expensive luxury stores you could possibly want to find in one spot. For an air-conditioned spot to spend the day shopping or lounging at a coffeeshop, the Marina Mall (www.marinamall.ae) might be more your thing. For local souvenirs, the Carpet Souk is a popular place for Abu Dhabi shopping – well, yes, for carpets. Located at the port end of Mina Road, this can be a fascinating experience for tourists to watch the haggling over these pretty woven pieces. Made in UAE Souvenirs (www.miuaes.com) is a non-profit set up to develop local handicrafts and you can find some lovely art works and one-off pieces at this store located in the Marina Mall and Women’s Union Abu Dhabi. But if it’s gold you’re after, the Madinat Zayed Shopping Centre and Gold Centre (www.madinatzayed-mall.com) might be more your thing. And of course, no trip can be complete with a visit to the Souk Qaryat Al Beri (www.soukqaryatalberi.com) – a contemporary Arabian souk, complete with abra boats to ferry visitors through the man-made canals. If you can force yourself to step away from the confines of what will surely be a luxury hotel experience, Abu Dhabi actually has a few offbeat things to offer. A drive down the Corniche is a must on every itinerary. Check out the expanse of the city, and the building works which seem to keep on going. If you’re not fortunate enough to be staying at a beachfront property, the Corniche Beach Park is a public access beach with plenty of lifeguards and regulated swimming areas. A visit to the Sheikh Zayed Grand Mosque (www.szgmc.ae) is a must on every itinerary – it is truly a stunning work of architecture, and the only mosque in the city that is open to all (except on Friday mornings – when it is open to worshippers only). Guided tours are available. To do something really unusual, a trip to the races may be in order – the camel races, that is. Races usually take place on weekend mornings. Head to the Al Wathba Camel Race Track (www.abudhabi.ae), a little outside the city where entry is free. Surprisingly, despite the focus on glitz and glamour, Abu Dhabi is an incredibly family-friendly destination with plenty for the kids to do and see as well. Summers are in fact the best time to take the family as the city boosts its annual offers and activities for kids during the holidays. 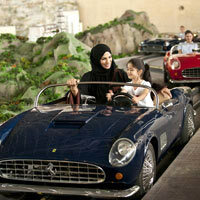 Yas Island is crammed with child-friendly options and enough to keep everyone entertained - the outdoor music venue, Du Arena (www.yasisland.ae) adds kid-friendly concerts into the mix, while Ferrari World (www.ferrariworldabudhabi.com) has the world’s fastest roller-coaster, the Formula Rossa. If that’s not enough, Yas WaterWorld (www.yaswaterworld.com) offers a whole range of water-based fun to keep everyone cool in the heat. And there’s always a must-see trip to the Yas Marina Circuit (www.yasmarinacircuit.com) – home to the Formula One Etihad Airways Grand Prix – where, when races are not on, kids can participate in a bit of go-karting on the track from Dhs55. A trip to the Falcon Hospital (www.falconhospital.com) can also be a bit of fun for the whole family – everyone can learn a bit more about the art of falconry, native to the region, and see some of these fierce and elegant birds at rest and play. For your five-star luxury experience, the stunning Qasr Al Sarab Desert Resort by Anantara in the Liwa Desert is a worthy choice. The resort, in the "Empty Quarter" or Rub' al Khali, offers options to head off on a camel, dune bashing, and falconry adventures, and provides a stunning oasis setting in the midst of the desert sands. And then get your Anantara Spa fix afterwards. The adobe-style accommodation is rustic chic with rich textured local fabrics that place you firmly in this destination. There are 206 villas and rooms altogether. Also expect a swimming pool, floodlit tennis courts, archery range and camel trekking facilities. Been there dune that? If crave a little more of an experience, Al Ain is more culturally inclined. An hour-and-a-half ride from Abu Dhabi, Al Ain is home to some of the ancient forts, oases, and heritage celebrations – like the Camel Festival. In Al Ain proper is the Al Ain Rotana, a traditional Bedouin style hotel offering classic modern accommodation and easy access to nearby sights. For those looking to go white-water rafting, kayaking, or surfing at the man-made Wadi Adventure, the Hilton Al Ain is an option. It is also located close to the Hili Archaeological Park and the Camel Market. Rooms are bright and airy, and there’s a range of fitness activities and pool. And if heights are your thing, then the Mercure Grand Jebel Hafeet hotel on Hafeet Mountain offers the usual all-inclusive resort experience, along with some stunning views of the surrounds. And that’s our Abu Dhabi fun guide, folks. Abu Dhabi currently offers a visa on arrival (also known as an entry-permit) to passport holders of 32 countries and city-states including Australia, Brunei, Denmark, Finland, France, Germany, Hong Kong, Japan, Malaysia, Monaco, New Zealand, Portugal, Singapore, South Korea, Spain, Sweden, Switzerland, the United Kingdom, USA and the Vatican State. Do check the official government website (www.abudhabi.ae) for any updates. Otherwise you need to apply for a visa through your local UAE embassy. Or if you are flying Etihad, they may be able to help. Eye scans are required at the airport. For travel agents, try: South East Asia Tours (tel: [971-6] 559-7881, fax: 559-7886); Arabian Adventures (tel: [971-4] 303-4888, www.arabian-adventures.com); Emirates Holidays (tel: [971-4] 343-9999, www.emiratesholidays.com). Visit the official Abu Dhabi visitor website (visitabudhabi.ae). The Islamic holiday is a Friday, and weekends are Friday and Saturday. Though most attractions will remain open over both Friday and Saturday, Fridays may see slightly early closing times. During the holy month of Ramadan, shops will change their hours, and restaurants mostly remain closed during the day, with some opening up after sunset. The exchange rate is US$1=Dhs3.67. Currency is the same here as it is in Dubai, and across the United Arab Emirates. Winter months are the “rainy” season, from November to March – when temperatures hover around 24C in the day, and drop to 13C at night. High temperatures in summer average around 42C – which is the off-peak season for hotels, and the best bargains can be found during this time. Although hotels and resorts are more liberal in attitudes to dress, covering shoulders and legs is recommended for the business traveller and those visiting financial institutions or government offices. Taxis are safe, and metered. As in Dubai, Pink Taxis have been introduced across the city, driven by women and solely meant for women and children under the age of 10 – although single women are okay to travel in the regular taxis as well. Meter fare is the same for a regular taxi as it is for a Pink Taxi. First flagfall from 6am to 10pm is Dhs3.50 with additional Dhs1.60 per kilometre; after 10pm, flagfall is Dhs4, with additional Dhs1.69 per kilometre. Taxes can either be flagged down or called through the booking line: 600-535353. For Car rentals, visitors need an international driving license. Car rentals start at about US$27 a day for a Toyota Yaris, the most basic car available. Avis (tel: [971-2] 633-4200), Hertz (tel: [971-2] 800-3130). Anantara Sir Bani Yas Island Al Yamm Villa Resort. Tel: [971-2] 801-5400, fax: 877-9638, (e-mail: alyamm@anantara.com or al-yamm.anantara.com). Centro Capital Centre. Tel: [971-2] 409-6666, fax: 409-6667, (www.rotana.com/centrohotels). Crowne Plaza Yas Island. Tel: [971-2] 656-3000, fax: 656-3001, (e-mail: info.cpyas@ihg.com or www.ihg.com/crowneplaza/hotels/us/en/abu-dhabi). Desert Islands Resort & Spa by Anantara. Tel: [971-2] 801-5400, fax: 801-5408, (e-mail: dirs@anantara.com or desertislands.anantara.com). Emirates Palace. Tel: [971-2] 690-9000, fax: 690-9999, (e-mail: reservation.emiratespalace@kempinski.com or www.kempinski.com/en/abudhabi/emirates-palace). Fairmont Bab Al Bahr. Tel: [971-2] 654-3333, fax: 654-3322, (e-mail: babalbahr@fairmont.com or www.fairmont.com/abu-dhabi). Hilton Abu Dhabi Hotel. Tel: [971-2] 681-1900, fax: 681-1696, (e-mail: abudhabi.info@hilton.com or www.hilton.com/en/hotels/uae). Hala Arjaan by Rotana. Tel: [971-2] 418-0000, fax: 418-0001, (www.rotana.com/halaarjaanbyrotana). Hyatt Capital Gate. Tel: [972-2] 596-1234, fax: 596-1235 (e-mail: abudhabi.capitalgate@hyatt.com or abudhabi.capitalgate.hyatt.com). InterContinental Abu Dhabi. Tel [971-2] 666-6888, fax: 666-9153, (e-mail: reservations.icabudhabi@ihg.com or www.ihg.com/intercontinental/hotels/gb/en/abu-dhabi). Jumeirah at Etihad Towers Hotel. Tel: [971-2] 811-5555, (e-mail: JADinfo@jumeirah.com or www.jumeirah.com). Le Royal Meridien Abu Dhabi. Tel: [971-2] 674-2020, (e-mail: info.lrmad@lemeridien.com or www.leroyalmeridienabudhabi.com). Monte Carlo Beach Club, Saadiyat Island. Tel: [971-2] 656-3500, (e-mail: info@montecarlobeachclub.ae or www.montecarlobeachclub.ae). Novotel Abu Dhabi Gate Hotel. Tel: [971-2] 508-9999, fax: 508-9990, (e-mail: H6948@accor.com or www.accorhotels.com/gb/hotel-6948-novotel-abu-dhabi-gate). Park Hyatt Abu Dhabi, Saadiyat Island. Tel: [971-2] 407-1234, fax: 407-1235, (e-mail: reservations.abuph@hyatt.com or abudhabi.park.hyatt.com). Park Inn by Radisson Abu Dhabi, Yas Island. Tel: [971-2] 656-2222, fax: 656-2223 (e-mail: info.abudhabi@rezidorparkinn.com or www.parkinn.com/hotel-abudhabi). Radisson Blu, Yas Island. Tel: [971-2] 656-2000, fax: 656-2001, (e-mail: info.abudhabi@radissonblu.com or www.radissonblu.com/hotel-abudhabi). Rosewood Abu Dhabi. 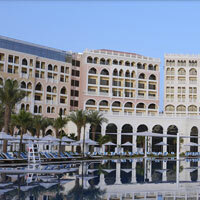 Tel: [971-2] 813-5550, (e-mail: abudhabi@rosewoodhotels.com or www.rosewoodhotels.com). Shangri-La Qaryat Al Beri. Tel: [971-2] 509-8888, fax: [971-2] 558-5999, (e-mail: slad@shangri-la.com or www.shangri-la.com/abudhabi/shangrila). St Regis Saadiyat Island. Tel: [971-2] 498-8888, (e-mail: reservations.saadiyat@stregis.com or www.stregissaadiyatisland.com). The Ritz-Carlton Grand Canal. Tel: [971-2] 818-8888, fax: 818-8088, (e-mail: rc.auhrz.leads@ritzcarlton.com or www.ritzcarlton.com/en/Properties/AbuDhabi). The Westin Golf Resort & Spa. Tel: [971-2] 616-9999, fax: 616-9998, (e-mail: westinauh.reservations@westin.com or www.westinabudhabi.com). Yas Viceroy. 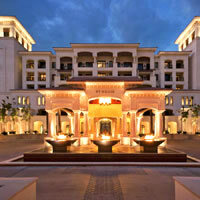 Tel: [971-2] 656-0700, fax: 656-0001, (e-mail: info@viceroyhotelgroup.com or www.viceroyhotelsandresorts.com/en/abudhabi). Al Ain Rotana. Tel: [971-3] 754-5111, fax: 754-5444, (www.rotana.com). Hilton Al Ain. Tel: [971-3] 768-6666, fax: 768-6888, (e-mail: alain@hilton.com or www.hilton.com/alain). Mercure Grand Jebel Hafeet. Tel: [971-3] 783-8888, fax: 783-9000 (e-mail: H3573@accor.com or www.mercure.com). Qasr Al Sarab Desert Resort by Anantara. 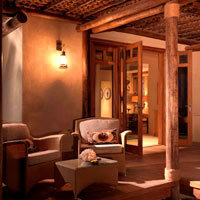 Tel: [971-2] 886-2088, (e-mail: infoqas@anantara.com or qasralsarab.anantara.com).